This section of the site is devoted to “makeovers” of popular kid’s meals that I happen to notice around me. Not every kid is going to want salmon and couscous right off the bat — I get that. I think it’s worth encouraging parents who have been feeding their children typical “kid food” to take baby steps in the right direction, because a total change overnight can be a shock to the child and can backfire dramatically. The last thing I want, as an advocate of conscious eating and real food meals, is for a family to suddenly 86 the familiar foods and go completely crazy with quinoa and legumes, then end up reverting back to the old patterns in a desperate bid to get their kids to eat something. Instead, I’d rather see people trying to make those familiar child-friendly foods themselves, with real ingredients and healthier cooking techniques, to improve their family’s eating habits a step at a time. This recipe is inspired by something my friend B.W. suggested to me for parties. Her original party bites were made with turkey tenderloin, which is also delicious in this, but I’m more likely to have some stray chicken hanging around the house, so I modified it. Combine the honey mustard, olive oil, salt, black pepper, and paprika in a shallow bowl. Add the chicken “fingers” and toss to coat. I usually do this in advance and let them marinate for about an hour, but it’s not necessary. Preheat the oven to 400 degrees and lightly grease a sheet pan. Lay the bacon pieces flat on a large cutting board. 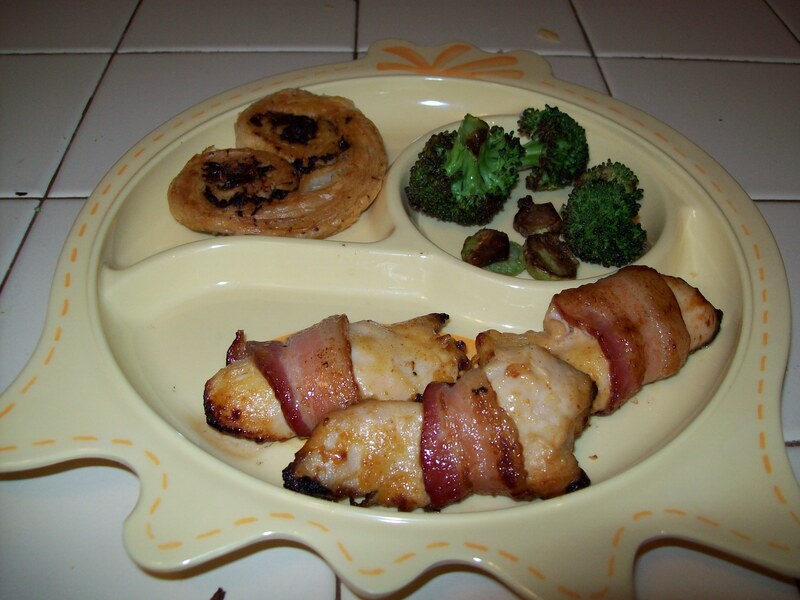 Place a chicken finger on each one and wrap the bacon around the chicken in a spiral. Place the wrapped fingers, seam side down, onto the greased sheet pan and bake at 400 for 15 minutes, until the chicken is cooked through and the bacon is slightly crisp. Ina Garten, the Barefoot Contessa, has a slightly more upscale recipe for these, which she calls “palmiers.” Hers has quite a few more ingredients. I took the easy route and modified it to just three items. Preheat the oven to 400 degrees. Unfold the puff pastry on a clean work surface. Using a rolling pin, lightly roll the pastry just to smooth out the fold marks. Spread the pesto evenly over the whole surface, then sprinkle evenly with the sundried tomatoes. To roll, start at one of the short ends and begin rolling tightly towards the center. When you get to the center of the pastry, stop. Move to the other end of the pastry and roll towards the center again, until the two rolls meet and touch. Slice the pastry crosswise into 1/4-inch pieces; when you set the slices on a baking sheet, they should look like hearts with somewhat rounded bottoms. Bake the hearts at 400 degrees for 15-20 minutes, until golden brown. 1/2 pound of broccoli, washed and cut into small florets. I also slice the stems in 1/4 inch pieces and roast those alongside the florets so nothing is wasted. Preheat the oven to 400 degrees. On a sheet pan, toss the broccoli with the salt, pepper, and olive oil until evenly coated, then spread the pieces out in a single layer. Roast for about 20 minutes, stirring once halfway through, until it’s tender and slightly browned. Preheat the oven to 375 degrees and lightly grease 3 sheet pans. Cream together the butter and sugar until smooth. Add the egg and vanilla and beat thoroughly. In a separate bowl, combine the flour, salt, and baking powder. Gradually add the dry ingredients to the butter mixture, stirring until just combined. The dough will be slightly sticky. Divide the dough mixture in half; add the cocoa powder to one of the portions of dough and stir until fully incorporated to make the cocoa wafer dough. Use a rounded teaspoon to form the dough into little balls and place them on the prepared sheet pans about 1 inch apart. Bake at 375 for about 10-12 minutes, just until set and vanilla wafers are barely golden brown. Remove from the cookie sheets and allow to cool completely before serving so the cookies will become crisp. In a nonstick skillet over medium heat, saute the garlic, onion, and peppers in 2 teaspoons olive oil until softened, about 3-5 minutes. In a large bowl, combine the cooked vegetables, salmon, yogurt, mayonnaise, lemon juice, dill, 1/4 cup of breadcrumbs, and salt and pepper, mixing gently until fully combined. You may want to add more breadcrumbs as needed; what you want is a mixture that will hold together in a ball when gently packed, but isn’t dry. While you’re mixing the salmon, heat about 2 teaspoons of the remaining olive oil in a large nonstick skillet over medium-high heat. Form the salmon mixture into small cakes, about an inch in diameter and 1/2 inch thick. Coat them gently and lightly in the remaining breadcrumbs. Working in batches, saute the salmon cakes in the olive oil until golden brown and crunchy on all sides. Serve hot. Lightly steam the carrots over simmering water until just fork-tender but not mushy, about 7 minutes. Drain and toss with honey, olive oil or butter, and salt and pepper until the carrots are lightly glazed. Cook the pasta according to package directions. While the pasta is cooking, combine all remaining ingredients in a food processor until smooth and creamy. Before draining the pasta, reserve about 1/2 cup of the cooking water. Drain the pasta and toss with the cheese mixture; if you want the sauce to be a little thinner, add some of the reserved cooking water until it’s the consistency you prefer. Serve hot. Preheat the oven to 400 degrees and grease or line 12 muffin cups. In a nonstick skillet over medium heat, saute the onion in the olive oil until translucent, about 3 minutes. Add the ground meat and cook until browned. Add the paprika, cumin, and salt and stir to combine; cook 1 minute longer. Turn off the heat. Whisk together the mustard, honey, and vinegar, and pour over the meat mixture. Stir until thoroughly coated. While the meat mixture is cooking, combine the cornmeal, flour, baking powder, salt, and granulated sugar in a large bowl. Make a well in the center of the dry ingredients and add the egg, milk, honey, and oil; whisk together just until the batter is fully combined and everything is moistened. Place about 1 1/2 tablespoons of batter in the bottom of each muffin cup. Spoon a heaping tablespoon of filling onto each portion of batter, then top the muffins off with the remaining cornmeal batter, covering the meat mixture completely. Bake at 400 degrees for about 20 minutes, until golden brown and set; a toothpick inserted into the top of the muffin should come out clean. Combine the grated sweet potato, flour, baking powder, salt, cinnamon, and nutmeg in a large bowl, tossing until the sweet potato is thoroughly coated. Whisk together the eggs and milk and pour over the mixture. Stir until combined. Heat a tablespoon of canola oil in a nonstick skillet over medium heat. Working in batches, spoon the pancake batter by heaping tablespoons into the skillet and cook until golden brown and crusty on the outsides, about 3-4 minutes per side. Let the pancakes drain on paper towels before serving; they’re good with applesauce for dipping, or even with honey or maple syrup. Lightly steam the green beans, just until crisp-tender (about 4-5 minutes). Drain and toss with the olive oil, orange juice, orange zest, salt, and pepper. Serve immediately. In a double boiler over simmering water, whisk the egg yolks and sugar until pale and thick (you should be able to see the tracks the whisk makes through the mixture), about 8 minutes. Remove from the heat and immediately add the avocado, lemon juice, salt, and bananas. Using an electric mixer at medium speed, mix the ingredients until smooth and creamy. Add the cocoa, vanilla, and cinnamon, and beat at low speed just until fully combined. At this point, you’ll probably want to taste the pudding — I suspect the sweetness will depend on the bananas used, so you might have to adjust it a bit for your tastes. Chill, covered, before serving. Mix all ingredients briefly but thoroughly, using your hands (which won’t compact the meat). Form into patties — you should get 4 patties out of 1 pound of meat, but if you’re feeding small children, you could make some 1/2 sized patties and potentially get even more yield. To cook, heat a nonstick skillet or griddle over medium-high heat and grease lightly with a little vegetable oil or olive oil. Cook the burgers for about 4-5 minutes per side, flipping only once if possible — this will help minimize sticking and keep the burgers in shape, as well as develop a nice brown crust on the outside of the patties. This cooking method will produce a medium burger; you can adjust the time by a minute or two in either direction to make burgers that are cooked more or less thoroughly for your preferences. To add cheese to your burgers, wait until you’ve flipped them, then lay the slices of cheese over the top (the cooked part) of the patties and allow to melt for 2-3 minutes as the bottom of the burgers finish cooking. Covering the pan briefly will help the cheese to melt more quickly, but is not strictly necessary. Serve the burgers on whole-wheat buns. 1) Vary your cheeses. Most parents stick with American because they’re afraid their kids won’t like stronger cheeses, but something like provolone, Monterey Jack, mild cheddar, or even sliced mozzarella could be given to many kids without a problem. As with any food item, the more you vary the cheeses you serve to your kids, the more they’ll develop a taste for stronger or sharper cheese. 2) Vary your breads. Patty melts are popular at our house — put your burgers on grilled rye bread, and consider adding caramelized onions and sauteed mushrooms to them (L. and P. eat the mushrooms but not the onions). You can also put burgers on English muffins, inside pitas, in tortilla wraps…. 3) Think outside the box. If your kids like the taste of marinara sauce, make a Parmigiana burger with mozzarella or provolone cheese and red sauce in place of the traditional ketchup. You could even use turkey or chicken burgers instead of beef. If taco night is a hit in your house, top the burgers with salsa and avocado. Preheat oven to 400 degrees. Slice the potatoes into thin rounds, about 1/4 inch thick. Toss them with the olive oil, garlic powder, salt, and pepper. Lay the potatoes in a single layer on a sheet pan and roast in the oven for 25-30 minutes, turning once halfway through cooking time, until golden brown and crispy on the outsides (they should still be a little fluffy on the inside — these are like a cross between a fry and a chip). Tip: If you try to flip the potato rounds, but find that they’re sticking to the pan, put them back into the oven and let them cook a bit longer; they’ll release when they’ve developed a crust on the bottom, which is what you want. Heat the olive oil in a skillet over medium heat; add the diced onion and peppers and cook for 2-3 minutes, until slightly softened and translucent. Add the corn and cook, stirring occasionally, until the corn is heated through. Season with salt and pepper. Mix the honey and lemon or lime juice and pour over the corn mixture; toss to combine, then remove from the heat and add the basil. Combine the fruit in a large bowl. Add the orange zest, juice, and honey, and toss until everything is well coated. Allow the fruit salad to stand for 15 minutes before serving so the flavors can blend. Heat a waffle iron on your preferred setting. Whisk together the flours, baking powder, cinnamon, nutmeg, and salt in a large bowl. Make a well in the center of the dry ingredients and add the eggs, vanilla extract, and butter. Gradually whisk in the milk until you get the right consistency — the waffle batter should be slightly thicker than pancake batter, but should still be pourable. Bake the waffles according to your machine’s directions. Combine all the ingredients in a small saucepan over medium-high heat. Cook, stirring occasionally, until the raspberries are broken down and the sauce thickens slightly, about 10 minutes. You may adjust the cooking time for your desired consistency. If you want a completely smooth sauce, you’ll have to cook for a few additional minutes and then strain through a sieve; if you want a very chunky sauce, with whole raspberries in it, add only 1 cup of the berries to begin with and cook down to a sauce, then add the second cup of berries and cook briefly to warm the berries through. Preheat the oven to 400 degrees. Using cookie cutters of your choice, cut the planks of squash and sweet potato into shapes — it will require some muscle to get through the vegetables, but metal cookie cutters will give a nicely defined shape. Toss the shapes with olive oil, salt, and pepper, and place in a single layer on a baking sheet. Roast the vegetables for 20-25 minutes, until they begin to brown and are fork-tender in the centers. Turn once during cooking. Mix all the ingredients thoroughly (but don’t overwork the mixture — it will get gummy and the burgers will be tough) and form into balls about 1 1/2 inches in diameter. Flatten gently into little patties. The slider patties can be cooked on a griddle, grill, or skillet with a drizzle of oil for about 5-7 minutes to cook through, or they can be baked on a lightly greased sheet tray at 375 degrees for 10 minutes. I have been baking my homemade burgers and they’ve turned out well. I usually add wheat germ to them and sometimes oatmeal. Love all these recipes! Aw, thanks! I’m really happy that you’re enjoying this particular feature of the blog. It’s actually been a challenge for me in some ways, because our kids eat a lot of things that others might call “grown-up” food, so really digging deep to think about the simple stuff we make and eat and how to make it more accessible for families that don’t cook regularly has been a different kind of experience. It’s so much fun for me to do, though!